Bloomington fire came to the rescue when this dog found itself on thin ice. 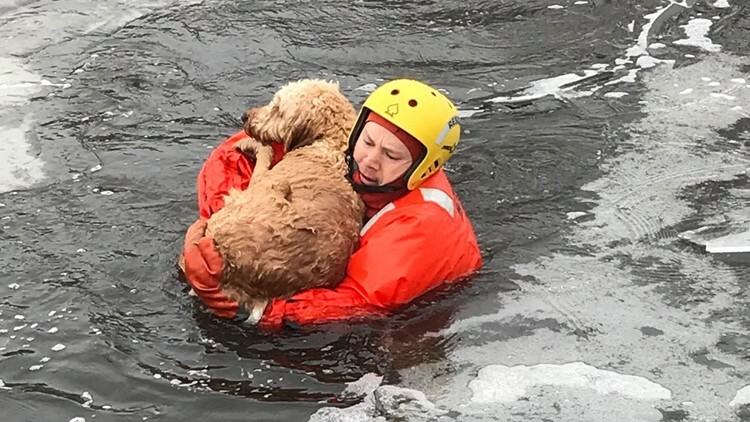 BLOOMINGTON, Minn. - A dog that found itself in hot – er, cold – water had to be rescued by a firefighter on Wednesday. Bloomington Fire Chief Ulie Seal said someone called 911 at 9:26 a.m., saying a dog had fallen through the ice and the owner was attempting to walk out onto the ice and rescue it. Bloomington fire and police responded to the pond on the 8200 block of Penn Avenue South. Seal said when crews arrived, they managed to talk the owner into staying on shore while they took care of the rescue. "One of our firefighters in a cold water rescue suit scooted out and scooped the dog up," he said. He said the dog was submerged in the water, hanging onto the edge of the ice. The pup has now been reunited with its owner. "Dog’s OK, cold and wet and probably a little tired," he said. Bloomington shared a photo of the rescue at about 10 a.m. on Wednesday. Moments later, they tweeted, "Be very careful around the ice on our lakes and ponds. It is very thin and dangerous." Thank you for saving this pup! Your compassion is amazing!